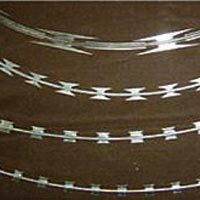 Razor wire that we offer is made with the help of cold clenching process. It has multiple sharp edges punched on both sides of it. It is known for creating a strong mental deterrent to the intruders. 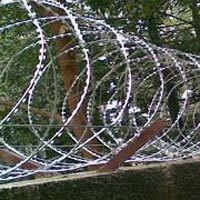 Our Razor Wire is difficult to bend and cut as it is very strong and reinforced with a high tensile core wire. It can be obtained from us in small as well as bulk quantities. 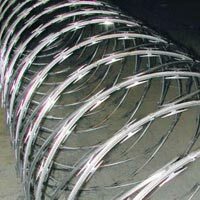 Applications : Razor wires are used for high security areas such as prisons, borders, factories (for possible theft), godowns, warehouses, nuclear facilities, etc. 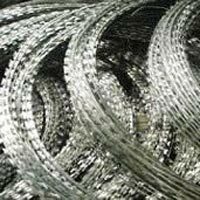 Installation : Razor wires should only be installed by skilled person because of the nature (lethalness) of the product. 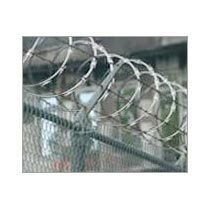 It can be topped over existing boundaries, chain link fence, weld mesh fence. 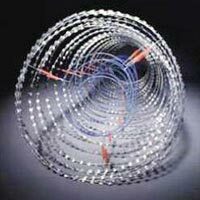 It requires custom made Y - arms to place the concertina coils or RBT on it. Accessories such as eye bolts/turn buckles are required for installation.